eQSL recebido: KD4BVG, Flowery Branch, GA, United States, 28 MHz, QSO w/ K3LP. 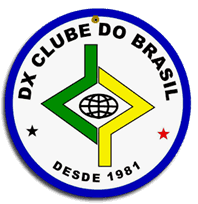 eQSL recebido: PU8YPL, Santarém, PA, Brasil, 28 MHz, QSO w/ F5OUX. eQSL recebido: KC4TVZ, Flowery Branch, GA, United States, 28 MHz, QSO w/ K3LP, etc. eQSL recebido: UZ5UA, Kiev, Ukraine, 28 MHz, QSO w/ CE3CT (WPX Contest 2013). eQSL recebido: LU5DQ, Temperley, Buenos Aires, República Argentina, 28 MHz, QSO w/ F5OUX. eQSL recebido: WP4DT, Mayagüez, Puerto Rico, 28 MHz, QSO w/ KP4ROS (WPX Contest 2013). 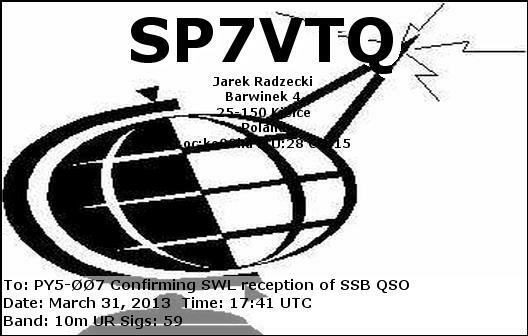 eQSL recebido: SP7VTQ, Kielce, Poland, 28 MHz, QSO w/ CE3CT (WPX Contest 2013). 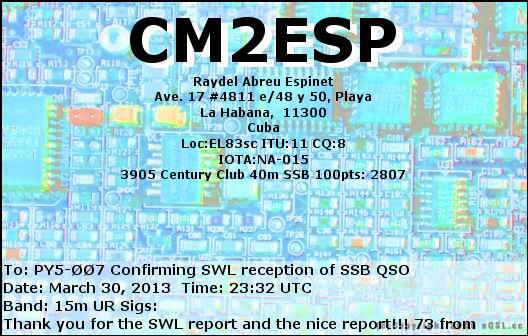 eQSL recebido: CM2ESP, La Habana, Cuba, 21 MHz, QSO w/ LR3M (WPX Contest 2013). 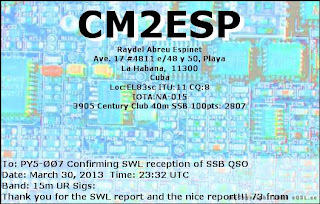 eQSL recebido: LU8DY, Bernal, República Argentina, 28 MHz, QSO w/ PY2PYB, DL9IU, PY2HT, etc (WPX Contest 2013). eQSL recebido: KE4QZW, Beaufort, SC, United States, 28 MHz, QSO w/ TJ3AY. eQSL recebido: PU2UJG, Itu, SP, Brasil, 28 MHz, QSO w/ WP4ONJ (WPX Contest 2013). eQSL recebido: KS4VOL, Goldsboro, NC, United States, 28 MHz, QSO w/ LR3M (WPX Contest 2013). 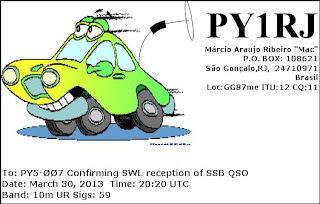 eQSL recebido: PY1RJ, São Gonçalo, RJ, Brasil, 28 MHz, QSO w/ NQ4I (WPX Contest 2013). 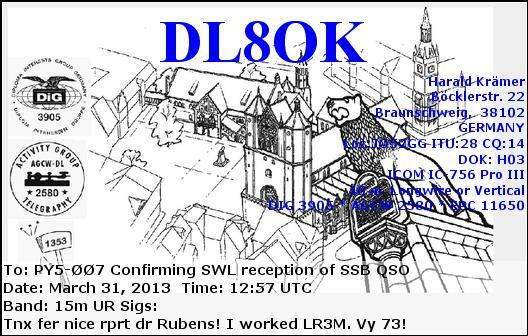 eQSL recebido: DL8OK, Braunschweig, Germany, 21 MHz, QSO w/ LR3M (WPX Contest 2013). 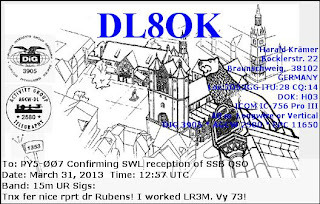 eQSL recebido: DK6AH, Malsch, Germany, 28 MHz, QSO w/ CE3CT (WPX Contest 2013). eQSL recebido: WB9FQS, Highland, IN, United States, 28 MHz QSO w/ 3G3W (WPX Contest 2013). eQSL recebido: VE2EZD, Saint-Georges (QC), Canada, 28 MHz QSO w/ 3G3W (WPX Contest 2013). eQSL recebido: JA3JFT, Suita City, Osaka, Japan, 28 MHz, QSO w/ LR3M (WPX Contest 2013). 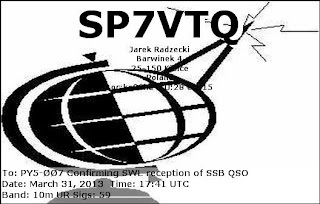 eQSL recebido: EC7JA, Sevilla, Spain, 28 MHz, QSO w/ LU8DY (WPX Contest 2013). eQSL recebido: N3CR, Lehighton, PA, United States, 28 MHz, QSO w/ LR3M (WPX Contest 2013). eQSL recebido: SV1QOT, Athens, Greece, 28 MHz, QSO w/ CE3CT (WPX Contest 2013). eQSL recebido: N8NOE, Waterford, MI, United States, 28 MHz, QSO w/ LR3M (WPX Contest 2013). 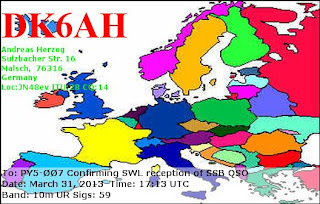 eQSL recebido: F6BZQ, L'Isle sur la Sorque, France, 28 MHz, QSO w/ LU8DY (WPX Contest 2013). eQSL recebido: ZS1ZS, Heiderand, Mossel Bay, South Africa, 28 MHz, QSO w/ RI1ANU. eQSL recebido: IK1VQY, Crevacuore (BI), Italy, 28 MHz, QSO w/ RI1ANU. eQSL recebido: PU2SPZ, São Paulo, SP, Brasil, 28 MHz, QSO w/ RI1ANU.